Eddie Clements generally writes and sends these newsletters. 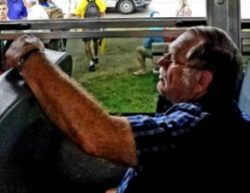 However my name is Braden Hobbs and for those of you who do not already know, I have the unfortunate duty of informing you that our fearless leader Eddie Clements has peacefully passed away. Eddie passed in Oshkosh after having spent the day enjoying Airventure. This legendary man is now in our memories, forever flying and gone west. His legacy will be carried on by HAWK and our generous supporters for many years to come. HAWK`s 1967 trainer made the annual pilgrimage to EAA airventure at Oshkosh this year under the command of HAWK`s new private pilot Braden Hobbs. 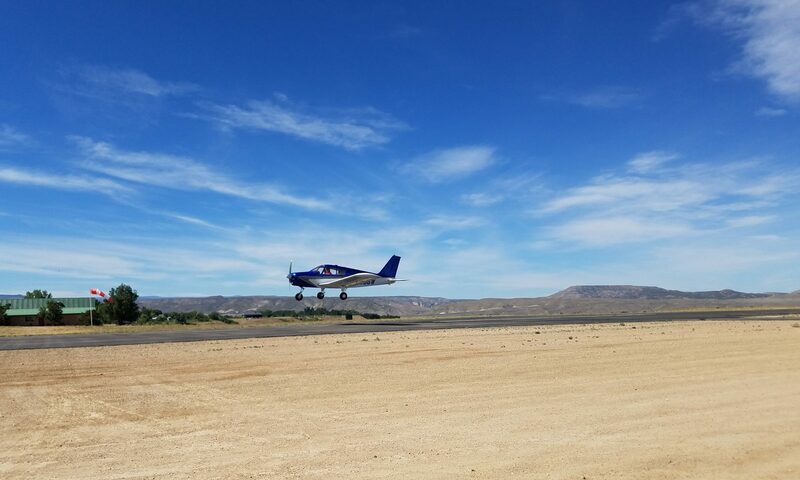 Braden made this flight along with HAWK`s flight instructor Sterling Hurst in Lightning 538RH and Shay Boe in Cessna 35441. During this flight the vacuum system in 06W failed. This problem was quickly fixed upon return from Oshkosh by installing a spare vacuum courtesy of Jerry Freidman. Since Oshkosh 06W has been flown for EAA young eagles by experienced pilot Jerry Freidman. Along with young eagles, Sterling H. has given many hours of flight instruction with Krista J., William M., William S., Logan B., Braden H. and many others. In an effort to keep kids flying, the HAWK Aviators board has approved Braden Hobbs to fly missions with HAWK kids. Since the first approval, Braden has flown 5 missions in 06W and Randy Owens has flown 2 in his Zenith 701. 9606W will be going into annual inspection on February 1 leaving HAWK without a trainer for a period of time. 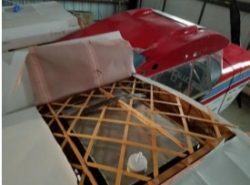 Along with inspection our Piper will receive a new fuel strainer valve and our directional gyro will need to be removed and a new one will need to be found. At 52 years young the Cherokee flies onwards. Work continues on HAWK’s Zenith 701, with all damage repaired and the new Rotax engine mounted. HAWK has been studiously working to fabricate engine controls and rig the control surfaces. Along with these tasks, new fairings have been molded with Pat Wehling in charge of the aircraft. Pat can be found rigging controls and reverse engineering plans. 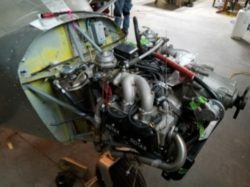 Tim Allen has been fabricating new parts based on Pat`s plans and with necessary changes to account for the new power plant and wings. Model aircraft builder Logan B. is putting his foam shaping skills to good work molding new aerodynamic fairings for the Zenith. These foam molds are then given a fiberglass shell. That shell is then removed from the foam and becomes a new fairing. William M. has taken Eddie`s plans for patching skin and has nearly completed making two new inspection ports out of two holes long ago misplaced. With new parts made and ordered every week it is beginning to look a lot like an airplane. HAWK is grateful to have a hanger neighbor with a completed 701, Randy Owens. He is happy to allow Pat, Tim, and Braden inspect his 701 frequently to see how something is supposed to look. HAWK`s flagship aircraft 0DH sprung a leak in the right side fuel tank and with no inspection ports in the area the hard choice was made to cut through the wing to fix the leak. Braden Hobbs along with student William M. cut open the top of the fabric and heated and removed glued wood in order to replace the fuel line and value assembly. Jerry F. inspected the repair and determined it fully repaired. The aircraft now awaits some minor wood splicing and regluing followed by restitching of the wing fabric. Sean G. has picked up where Eddie left off in the restore of HAWK`s 172. 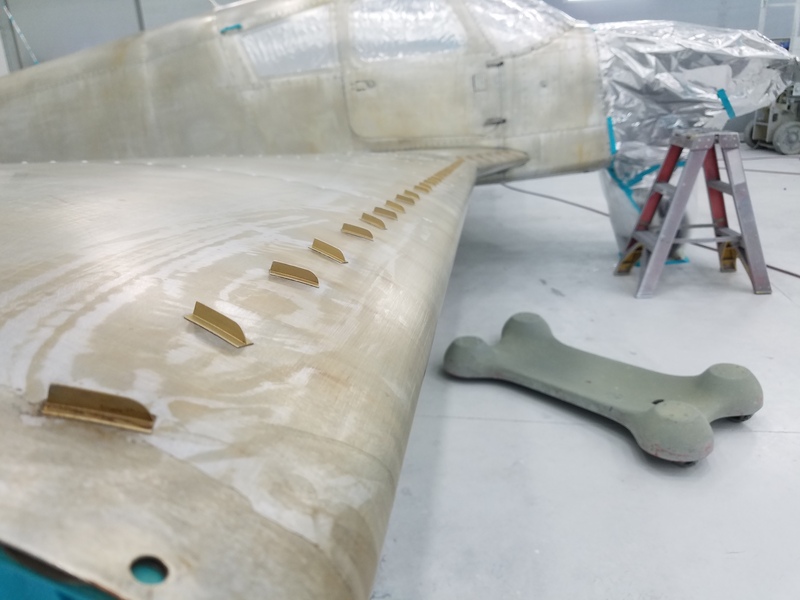 With the wing disassembled and control surfaces detached, new skins are being fabricated. With the aid of capable students Solomon B. and Krista J. the Cessna wing is being put back together and will soon be in one piece. With aid of Braden H. control surfaces are also being made whole again. At this rate the hail riddled Cessna may be put together within a year. However the expensive part has yet to come as the Cessna needs new electronics, a new interior and we have yet to even look at the engine. Unfortunately after Eddie`s passing we no longer have a balloon instructor or even pilot thus our impressive collection of hot air balloons sits mostly untouched awaiting a new pilot to teach us the lessons of three dimensional billiards, as Eddie said. Despite the loss of Eddie’s knowledge, his main A+P student and balloon student, Braden Hobbs supervised assembly and organization of the different systems, determining what systems would be determined airworthy if inspected and what was wrong with the others. HAWK however has now gained a new source of information in a new up and coming pilot. 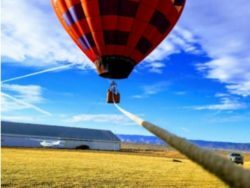 Congratulations to James Mullin who passed his hot air balloon private license check ride this month, we are now awaiting his government paperwork to be processed. 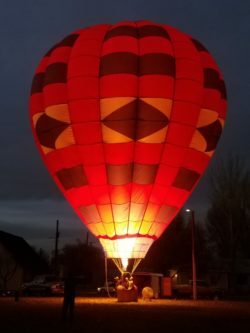 After a mechanic is found to do an annual inspection on 90555 HAWK balloons can again take to the air. As you may have heard, the beautiful late-model and low-time Lightning aircraft donated to HAWK last Spring by Ron and Gayle Huddleston, which we intended to sell at Oshkosh last summer, suffered a nose-gear collapse (and a serious prop strike) upon landing there. Luckily, the plane was insured and no one was injured. 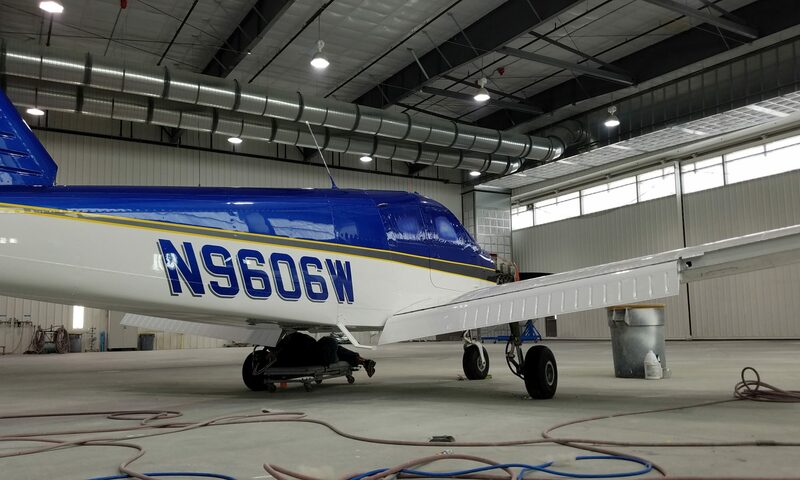 Repairs at a facility at Oshkosh are about complete, and this plane will again be offered for sale in the coming months. Braden Hobbs has been teaching new toolbox instructors William M. and Shay Boe the art of teaching kids and fixing their mistakes and two more toolboxes have been finished. Congratulations to Aidan (left) and Britton (Eddie`s grandson on right) their hard work has been rewarded and they now have a toolbox that will last for a long time and have moved on to working on airplanes. Three years ago I stood right where these two stand and now I am a successful leader at the airport. These two have the potential to outdo me by leaps and bounds. Ground school instructor Michelle Hobbs has continued her efforts in education. Ground school remains on target of teaching basic aviation knowledge. Flight Instructor Sterling Hurst continues this education with his own advanced ground instruction to flight students. HAWK was donated a flight simulator control setup and Braden Hobbs found a free computer. With Jerry Freidman`s efforts to fix said computer HAWK may soon have an operational flight simulator to use for demonstration. Eddie was donating the use of his hanger as the main hanger and after his passing HAWK had to take on the rent of another hanger. Moving the tools and build hanger into one of the other hangers was considered. However, due to lack of space and thanks to gracious donors the build hanger has remained where it is for now. Nevertheless the idea is still on the table. Eddie was HAWK`s general manager and with his loss the board of directors Bryan Miller, Michelle Hobbs, Sterling Hurst, John Wilson, Don Coleman along with help from John Caldwell have had to pick up lots of slack. Although a challenge the board has done a good job and the chaos is limited. With the board organizing adults and Braden organizing kids the work is back on track and attendance is up. Recently a HAWK aviator has secured a job in aviation. Braden Hobbs signed a contract with the US Army as an air traffic systems controller and will leave for basic training July 22nd marking another of Eddies milestones of success for HAWK. Many people have taken new roles after Eddies departure and these roles are still shuffling around. Two HAWK aviators will be graduating this year in the class of 2019, William S. and myself, Braden Hobbs. Finding new instructors and teaching others of the past and of what Eddie taught me has been a great challenge and priority for me. The future is truly an uncertain place for HAWK. However with that said for as long as there are kids to be taught and funds/materials to teach with, HAWK will be here to follow the mission Eddie provided, teach kids aviation. We especially wish to thank all the supporters who have given HAWK financial support in the six months since Eddie Clements passed away. We received many contributions at his Memorial Service and several substantial ones since then, including very generous amounts from Dalt and Patsy Garlitz, and from Irvine Smith. It has been especially helpful during this period of transition to have the funds we need to maintain our youth programs. Thank you all so very much. 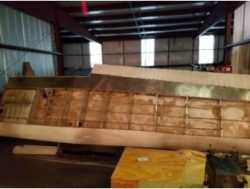 In addition, during the last year Russell Franke donated a late 1940s Luscombe (sans motor), and Robert MacAdams of Green River, Wyoming donated a used Jabiru 120hp motor (both were even delivered to us). Without the support of these exceptional individuals and company’s HAWK could not function. 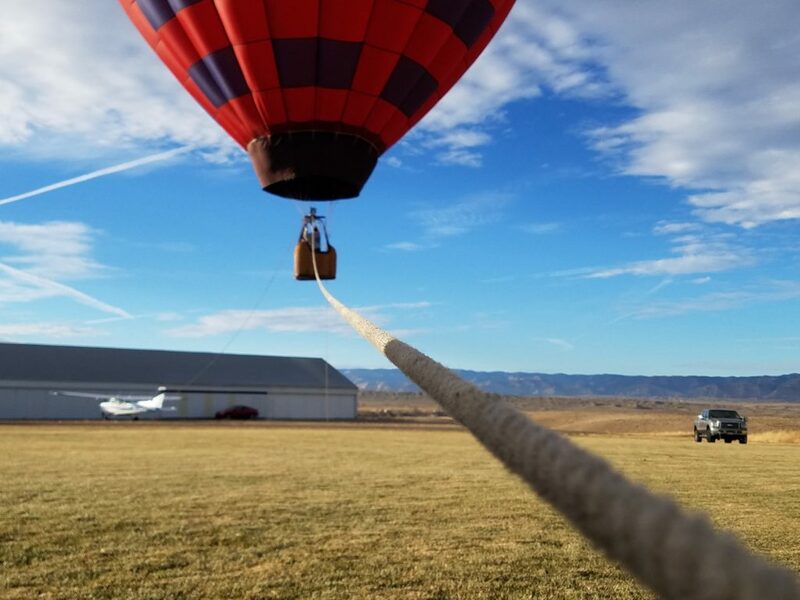 Recently HAWK began work on our firefly hot air balloon N90555. Upon donation the envelope was found to be porous and not flightworthy. Slowly HAWK was donated a basket and then another along with fuel lines and tanks until we had all of the pieces necessary to put together our balloon. However with these parts the problem of the porous fabric remained but never fear HAWK was given new balloon coating from firefly to be applied to the inside of HAWK’s balloon. 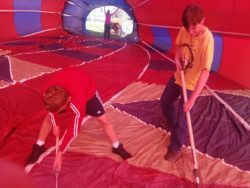 Caleb, Abarim, Michelle, Eddie and Braden coating the hot air balloon. The entire inside of the balloon had to be coated in the latex based clear coating that was sprayed on and rolled in taking four days to paint over 70000 square feet of fabric until on the evening of day four when HAWK members left the balloon and the balloon was stood up in Fruita’s Reed Park. 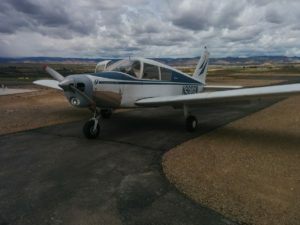 After nearly two months of construction and nearly two months of painting HAWK’s Piper Cherokee has returned to service. During the construction, the plane was jacked up and the gear removed to replace a wing skin. Also during that time all of the fiberglass was removed and repaired. Thank you to Don Coleman for donating a powerflow exhaust system for HAWK’s Cherokee. A new cowl was made, and the power flow exhaust system installed. These updates allowed the plane to be sent to West Star Aviation for paint. 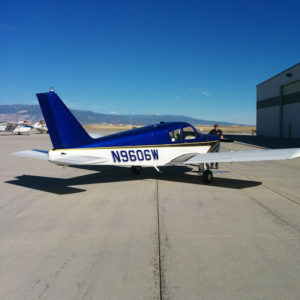 The Cherokee before its flight to West Star Aviation. 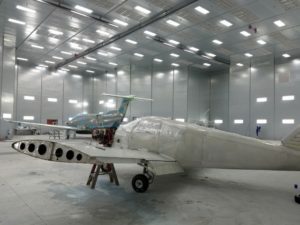 At West Star Aviation the plane was taken apart and stripped of its paint. During this time a set of micro VG’s courtesy of Annie Brogan with Micro AeroDynamics were installed. Micro VG’s were installed on Hawk’s Piper Cherokee. Thank you to Micro VG for donating a full set of micro VG’s for HAWK’s Piper Cherokee. The Cherokee was then primed painted and buffed. 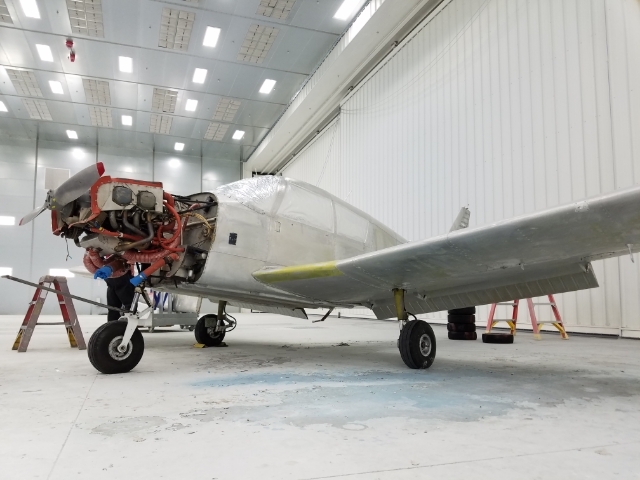 West Star Avation donated new screws and hardware to reassemble HAWK’s Piper. This donation is in addition to primer, paint and masking/buffing materials. There are far to many names to mention but HAWK would like to thank each and every person involved in the Cherokee project at West Star Aviation. 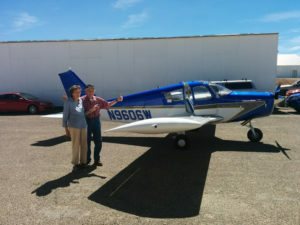 Sterling Hurst flew the Cherokee back to Mack Mesa just in time for the EAA 800 meeting where everyone admired the brand new 1967 Piper Cherokee. Herman Allmaras, the Cherokee’s original donor, was given the first official ride in the Cherokee. The Cherokee with it’s first coat of paint. 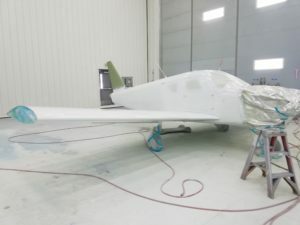 Weeks 2 – 5 were filled with priming and painting the aircraft with its new design during week 2 the aircraft was first given a coat of aircraft green primer and then after lunch two coats of Matterhorn White were applied. In the final masking stage, the N numbers were masked and painted blue with a grey shadow. 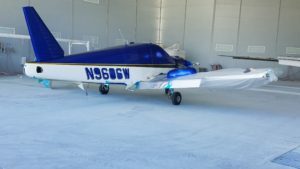 Throughout week’s 3 and 4 West Star Aviation masked and painted the aircraft with its new blue and grey paint design and a small chrome yellow stripe. Our Cherokee before and after buffing. Week 4 was a busy week for week for HAWK members Braden and Jaden, it was during this week that that the Cherokee was buffed and cleaned so that final touch up could be made to the paint. At the end of week 4 it is clear that HAWK’s Cherokee will be a show stopper. During the next week the Cherokee will be put back together and returned to service. HAWK’s Cherokee being prepped for paint. Early in the week prep work began on Hawks Piper Cherokee. 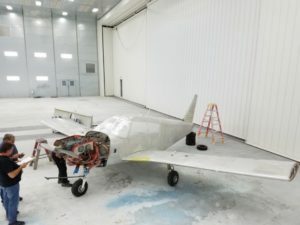 West Star Aviation stripped the aircraft of its original paint and disassembled it for painting. Later in the week all of the composite pieces for the aircraft were primed and made ready for painting. 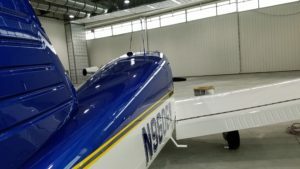 West Star Aviation’s paint hanger can service aircraft up to a 100 foot wing span. 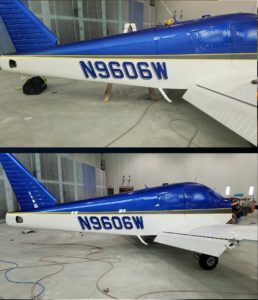 On Saturday Braden and Jaden went to West Star Aviation and helped them strip what was left painted on the airplane.